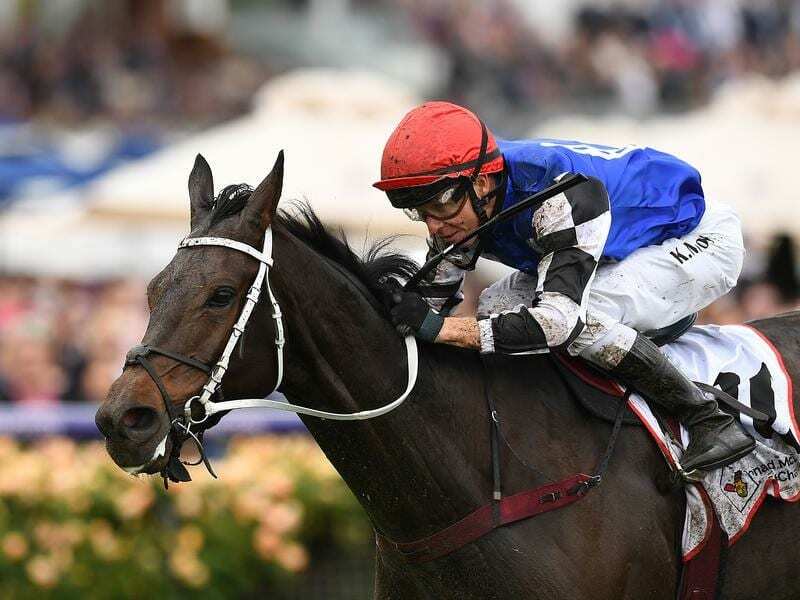 Chris Waller-trained import Shraaoh has won a staying test at his Australian debut on a rain-sodden Flemington. The Irish-bred outstayed his rivals to claim Tuesday’s Ronald McDonald House Charities Plate over 2800m. Ridden by Kerrin McEvoy, Shraaoh ($6) ran out a 1-3/4 length winner over the $5 favourite Steel Prince with Azuro ($6.50) three-quarters of a length away third. Shraaoh endured a tough trip from England with a plane-full of other international hopefuls for Melbourne’s spring carnival. The flight was delayed almost 24 hours due a cracked windscreen in Sharjah which stretched the trip from Newmarket to Werribee’s quarantine centre to almost 60 hours. After finishing his quarantine stint, Shraaoh was shipped to Waller’s Flemington stable where he continued to be worked with Tuesday’s race in mind. “He kept eating, doing well and doing the basic work,” Waller said. “We’ve just done basic ground work with him, similar to what we do with our stayers as he came over here very fit. “It’s been an interesting exercise. “I said to the owners we should trial him but they said don’t dare trial him. “I had a chuckle to myself when he went to the front thinking he’s got to be fit to hang on. Waller said he’s unlikely to press on to the Sandown meeting on November 17, preferring a break and setting him for next year’s Sydney Cup. “He could be back here next year,” Waller said in reference to the Melbourne Cup.